I don’t celebrate Valentine’s day, but, yes, I always make something spcl. for him on this day. Because we are a foodie family, and we just need a small excuse to make something special for us! 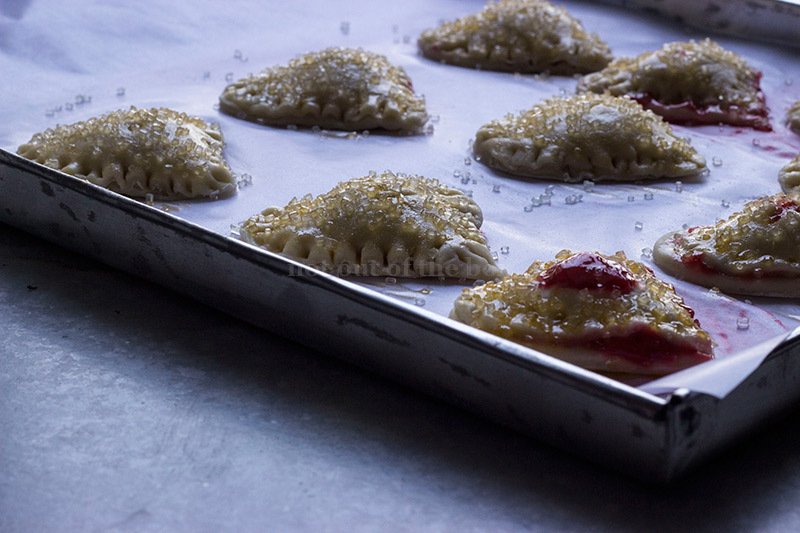 Making hand pies was on my mind for quite a long time, but that never happen before. I’m glad that I tried, they tasted delicious, looked damn cute and appeared so very pretty in all the photos what I’ve taken. With little effort and patience you also can make them, these are worth trying! Chop the cold butter roughly or grate it using a grater. Chopping was much easier for me, so I did that. In a large bowl add ap flour, salt and sugar. Mix well, add cold butter. Mix well using your fingers, until the flour mixture resembles fine breadcrumbs. Add water and knead the dough well on a lightly floured surface. Divide the dough, forming two equal discs. Wrap the discs using cling film and chill in the refrigerator minimum for 1 hour or more. In a nonstick frying pan add everything mentioned for ‘pie filling’. Keep stirring on low flame, until the mixture thickens (it took 5 minutes for me). Mash the strawberry pieces with the help of spatula or fork. Transfer in a bowl, and cool completely at room temperature. 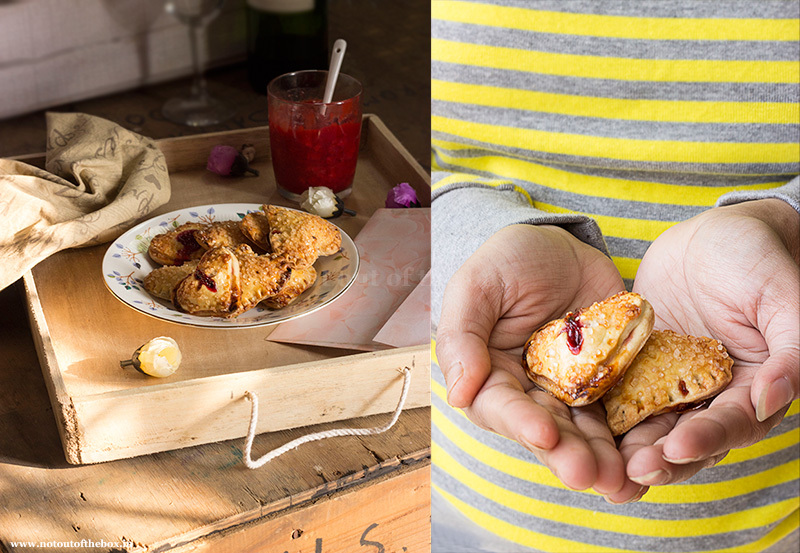 I used a cookie cutter for making these hand pies, that is too small size for hand pies what I felt, and I experienced little difficulty to seal them, the end result was very cute and delicious, but it was lot of hard work at that point of time. So I’ll suggest use a little big sized cookie cutter rather than a regular one, or cut your own pie sheets for whatever size you want by just using your knife. Now line a baking tray with baking paper. Take out one disc dough from fridge, on a lightly floured surface roll out the chilled pastry. 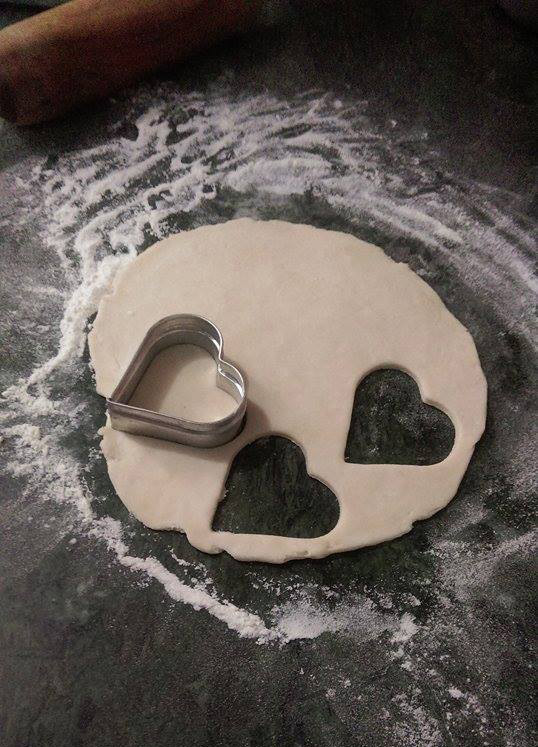 Using your cookie cutter cut out the pieces out of it, and arrange in the baking tray. 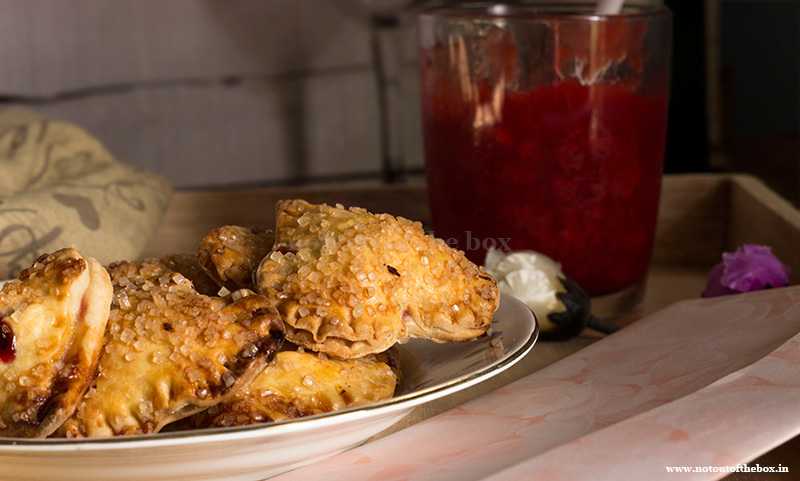 Place about 1 tsp of the filling in the middle of each hand pie. Roll the other piece of dough on a lightly floured surface, cut out some pastry pieces again (these are to cover the hand pies). Using a fork, press the edges together to create a tight seal. Gently make a cross on the top of each hand pie using the knife. Brush the top of each hand pie with the beaten egg. Sprinkle some sugar on top of each hand pie. Refrigerate for 30 minutes. Preheat the oven to 220 degree centigrade. Place the baking tray into the oven directly from the fridge. Bake for 8 minutes. Reduce the oven temp to 175 degree centigrade. And bake for another 10-12 minutes or until golden on top. Remove from oven. Let it be cooled little bit. Now line a baking tray with baking paper. Take out one disc dough from fridge, on a lightly floured surface roll out the chilled pastry. 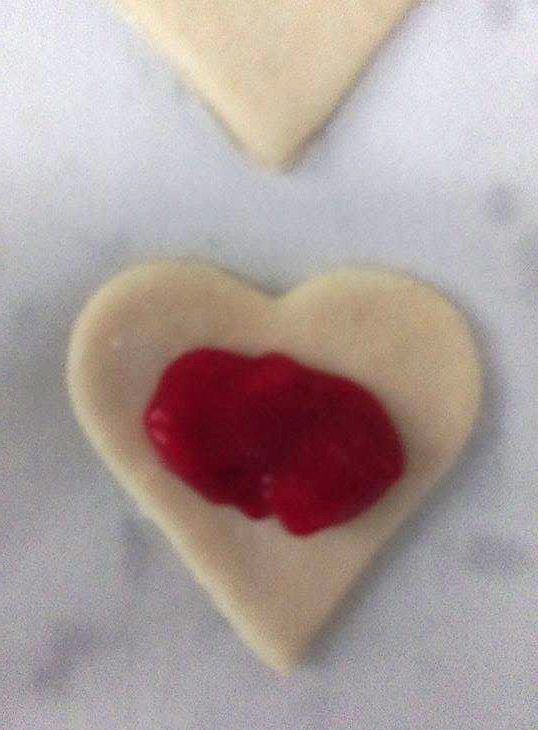 Using your cookie cutter cut out the pieces out of it, and arrange in the baking tray. Place about 1 tsp of the filling in the middle of each hand pie. Roll the other piece of dough on a lightly floured surface, cut out some pastry pieces again (these are to cover the hand pies). Using a fork, press the edges together to create a tight seal. Gently make a cross on the top of each hand pie using the knife. 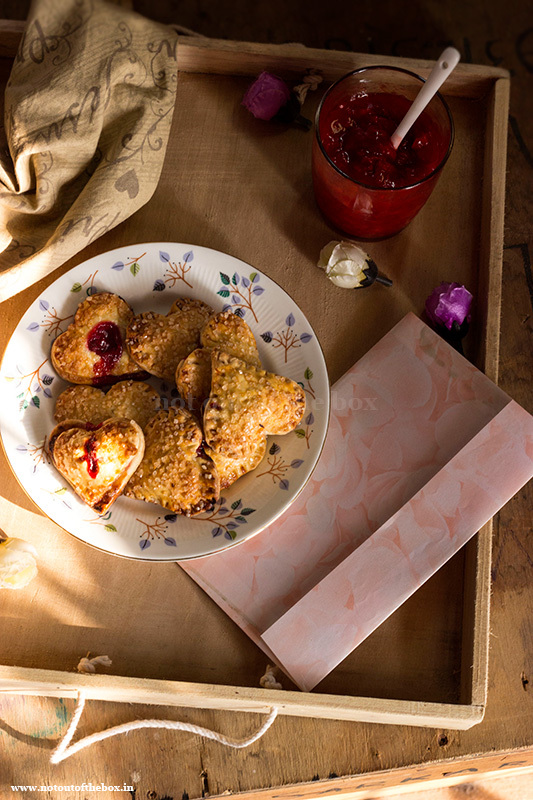 These beauties are ready to please your loved one…Enjoy! Just one quick question , can we refrigerate these once filled and bake them the next day ? Thank you Shilps 🙂 Sorry for replying you little late. Yes, of course you can always refrigerate these pies for a day or two in an airtight container before baking. Just preheat the oven and bake them straight away taking out from fridge. These are soooo cute and look so good. My husband would love these; he’s a ‘grab and go’ type of snack eater.